New Zealand and Australia; kissing-cousins, comrades in arms, sport-warriors, and gastronomic rivals. First there was the great pavlova battle - which country was it that invented that pinnacle of epicurean puff of marshmallow? Apparently, the Kiwis. Now the battle is on for which country came up with the flat white coffee. According to Australian food historian, Michael Symons, that claim to fame goes to the Aussies. But, as Symons puts it, "perfected" in New Zealand, particularly Wellington. 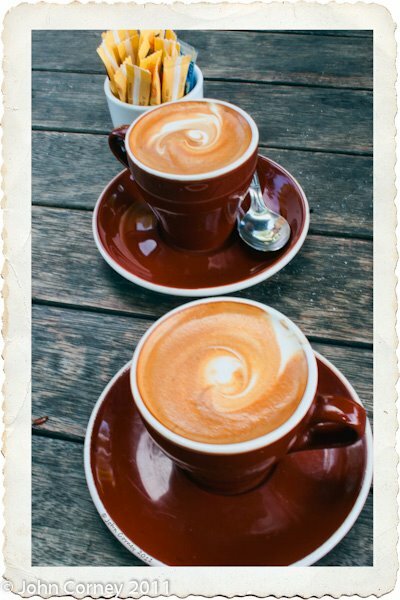 The flat white should soon be recognised as the single greatest Antipodean contribution to world gastronomy - so long as it's made the Wellington way. Returning to Sydney [from Wellington] four years ago, I discovered baristas of [the Wellington] calibre almost impossible to find, so I invested instead in my own Mazzer grinder and ECM Giotto machine, and am still learning. I experienced a similar conversion to home-made flat whites when I moved to the U.S. from New Zealand. This, I have to say, was the genesis of this blog which grew out of my home-based endeavor to perfect espresso coffee-making at home. I'll leave it from here to allow you to read Symons extensive argument that the flat white "is truly milk coffee's fulfilment, now taking over the world." Then you can read my step-by-step on how to make a flat white at home.